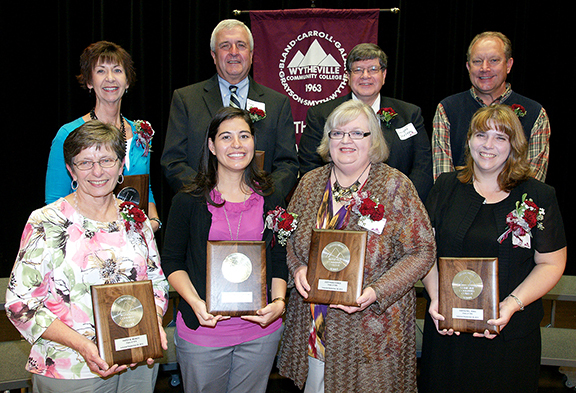 The Distinguished Alumni Hall of Honor was established as part of the college’s 50th anniversary celebration for the purpose of recognizing deserving WCC alumni for their contributions to education, business, and civic organizations, as well as their achievements since graduating from the college. Nominations will be taken annually. Nomination forms, instructions and requirements can be found here. Please contact the WCC Educational Foundation at (276) 223-4771 with any questions related to nominations. Pictured are (front row, left to right) June M. Mitchell, Dr. Carolyn Widner Ward, Sandra K. Thomas, and Rita K. Key; (back row, left to right) Dr. Dennis R. Throckmorton, WCC President Charlie White (who presented the awards), C.M. Mitchell, Jr., Kenneth Wm. Heath, Robert T. Gordon, Dr. Richard G. Copenhaver, and J. Michael Burris. Joseph Michael “Mike” Burris attended WCC from Grayson County and earned his Associate’s Degree in business administration in 1972. He completed his education with a B.S. from Virginia Tech in 1975. Burris then became a certified public accountant. He lives in Charlottesville and is the Vice President and Chief Financial Officer of the Blue Ridge Region for Sentra Healthcare, including Sentra Martha Jefferson Hospital and Sentra RMH Medical Center. Dr. Richard G. Copenhaver originally attended WCC as a resident of Wythe County, and he completed his Certificate in dental assisting from WCC in 1975. Copenhaver then earned a B.S. in dental hygiene from Old Dominion University in 1977 and went on to receive a D.D.S. from MCV-VCU in 1984. Copenhaver is a dentist at Drs. Campbell, Throckmorton and Copenhaver, D.D.S., P.C. in Wytheville and is also President of the WCC Scholarship Foundation Board. Robert T. Gordon was a resident of Bland County while attending WCC, and he earned an Associate’s Degree in business administration in 1985. Gordon also received a B.S. in business management from Radford University in 1987 and a M.S. in human resources management and labor/employee relations from Virginia Tech in 1990. Gordon serves as Manager of Human Resources, Processes, and Employment Practices for Lowe’s Companies, Inc. in Mooresville, NC. Kenneth Wm. Heath attended WCC from Smyth County, and he earned an Associate’s Degree in communication arts in 1984. Heath continued his education at East Tennessee State University, earning a B.A. in communication. He began a career in media promotions and marketing. Heath now serves the Town of Marion as Director of Economic and Community Development and Executive Director of the Marion Downtown Revitalization Association, Inc.
Rita K. Key was a Grayson County resident when she attended WCC and graduated with her Associate’s Degree in science. She earned a B.S. mathematics from Radford University and a M.Ed. from Virginia Tech in Curriculum and Instruction. She also studied Educational Leadership for Administration and Supervision PreK – 12 at RU. Key began teaching at Galax High School in 1980 and has taught math, science and physics. She has been an adjunct faculty member at WCC since 1984. She is the Assistant Principal at GHS. Clarence “C.M.” Mitchell, Jr. originally attended WCC as a resident of Grayson County, and he completed his Associate’s Degree in science from WCC in 1968. Mitchell graduated with a B.S. in pharmacy from the Medical College of Virginia School of Pharmacy in 1971. Mitchell worked as a pharmacist for many years and is currently the Director of Pharmacy Services at Twin County Regional Hospital. He is the Mayor of the City of Galax, a position he has held since 1992. June M. Mitchell was a Carroll County resident when she attended WCC, earning her Associate’s Degree in mental health technology in 1980. Mitchell also earned a B.A. in religious education from Blue Ridge Christian College in 1983. Mitchell spent over 50 years advocating for the mentally and physically disabled. She began serving as a Human Rights Advocate with the Department of Behavioral Health in 1978 and retired from that position in 1996. Sandra K. Thomas was a resident of Wytheville when she attended WCC, and she completed her Associate’s Degree in science from WCC in 1970. Thomas went on to earn a B.S. in biology and general science in 1972 and an M.S. in science education in 1976, both from Radford University. She also earned a certificate in earth science in 1980 from RU. Thomas retired from teaching science courses after 33 years with Carroll and Wythe counties public schools. She is a WCC Career Coach at George Wythe High School. Dr. Dennis R. Throckmorton was a resident of Wytheville while attending WCC, and he earned an Associate’s Degree in science in 1974. He also earned a B.S. from Virginia Tech in 1976 and a D.D.S. from Virginia Commonwealth University in 1980. Throckmorton is a dentist at Drs. Campbell, Throckmorton and Copenhaver, D.D.S., P.C. in Wytheville. He is the Vice President of the WCC Educational Foundation. Dr. Carolyn W. Ward attended WCC as a resident of Wythe County, and she completed her Associate’s Degree in general studies in 1989. She earned a B.S. geography from Emory & Henry College and an M.S. in 1994 and a Ph.D. in 1998 both in outdoor recreation from Virginia Tech. Ward worked as a professor and instructor at Virginia Tech, Humboldt State University, West Virginia State University, and Royal Road University in Canada. She is now the Chief Executive Officer of the Blue Ridge Parkway Foundation. Pictured are (front row, left to right) Patsy B. Muncy, Dr. Eugenia Larrowe, Judy King Yonce, and Carolyn Lundy King; (back row, left to right) Angela Y. Lawson, R. Edward “Edd” Houck, M. Dwight Shelton, Jr., and Douglas W. Fender. Douglas W. Fender attended WCC from Grayson County and earned his Associate’s Degree in General Studies in 1981. He completed his education with a B.S. from Radford University in 1983 and an M.S. from Radford University in 1985. Fender then embarked on a career with the Federal Bureau of Investigation from 1991 until his retirement in 2013. At the time of his retirement, he was a special agent and senior special bomb technician. Fender was closely involved in terrorism response activities, including the 9-11 investigation at the Pentagon, and the 1996 Centennial Park bombing at the summer Olympics in Atlanta, Georgia. He has received numerous awards, including the Combat Theatre Awards from the FBI in 2012 and the Superior Civilian Service Award in 2006 from the U.S. Army. He has been a Scout Master with the Boy Scouts of America and is currently a Salvation Army volunteer. Senator R. Edward “Edd” Houck originally attended WCC as a resident of Smyth County, and he completed his transfer degree in 1971. Houck earned his B.S. at Concord College in 1973 and his Master of Education from the University of Virginia in 1975. He was employed by the Spotsylvania County school system from 1973 to 1991, during which he was a teacher and counselor at the middle school level. In 1992, he joined the City of Fredericksburg school system and served as the Director of Student Services until his retirement in 2007. Upon his retirement from Fredericksburg, he joined Mary Washington Healthcare, Inc. as Director in the Department of Community Programs, a position he held until this year. Houck also served as a member of the Virginia General Assembly from 1984-2012, representing the 17th District. He served as chair of the Senate Education and Health Committee and the health and Human Resources Subcommittee. He was chair of the Joint Commission on Health Care, a member of the Governor’s Commission on Higher Education and the Governor’s Commission on Healthcare Reform. Carolyn Lundy King was a resident of Bland County while attending WCC, and she earned her Associate’s Degree in Nursing in 1992. She then completed her B.S. in Nursing at Bluefield State College in 2004 and her M.S. in Nursing at Marshall University in 2009. King has been a staff nurse at Wythe County Community Hospital and a staff nurse and nursing supervisor at the Bland County Medical Center. She currently serves as a Family Nurse Practitioner at the Bland County Medical Center. Eugenia A. Larrowe, D.D.S. attended WCC from Galax, and she earned her General Studies degree in 2004. She then completed her B.S. at Liberty University in 2007, her master’s degree at Virginia Tech in 2009, and her D.D.S. from the Virginia Commonwealth University’s School of Dentistry in 2013. She is currently a family dentist working in Galax. Larrowe’s community service activities include her membership in the First Baptist Church of Galax; free dental clinic externships in various Virginia locations; the Mission of Mercy Dental Project in Grundy and Wise counties in Virginia; and dental mission trips to Costa Rica from 2006 through 2009. Larrowe is a native of Costa Rica who moved to Galax as a child with her parents, who were “reverse missionaries” to the Hispanic population of the Galax area. Angela Y. Lawson was a Wythe County resident when she attended WCC, graduating with her Associate’s Degree in pre-teacher education in 1977. She earned her B.S. from Virginia State University in 1980, her M.S. from Virginia Tech in 1998, and her education specialist degree from the University of Virginia in 2004. Lawson was previously employed by the public school systems in Wythe and Grayson counties and the City of Galax. Prior to joining the administration of WCC as Vice President of Workforce and Occupational and Technical Programs, she was employed at New River Community College as the Interim Vice President of Workforce Development and Coordinator of Career Pathways. Patsy B. Muncy was a Bland County resident when she attended WCC, earning her nursing degree in 1974. She completed her B.S. at Bluefield State College in 1994 and her M.S. at Old Dominion University in 2005. She was an Intensive Care Unit and Cardiology Care Unit nurse at Wythe County Community Hospital from 1974 until 2005. She taught as an adjunct faculty member from 2001 to 2005, when she joined the nursing faculty at WCC full time.Muncy was the recipient of the 2004 Excellence in Professional Nursing Award presented by Wythe County Community Hospital and she received the 2010 WCC Distinguished Teaching Award. Millard Dwight Shelton, Jr. attended WCC from Wythe County and earned his Associate’s Degree in 1969. He later earned his B.S. from Virginia Tech in 1971 and his M.B.A. from Virginia Tech in 1983. He began his career as an audit supervisor at Ernst & Whinney in Winston-Salem, a position he held from 1971 to 1979. Since 1979, Mr. Shelton has been employed at Virginia Tech. There, he has held the titles of Director of Audits and Management Services, University Controller, University Budget Director, and Vice President for Budget and Financial Management. Since 2008, he has served Virginia Tech as the Vice President of Finance and Chief Financial Officer. He is a member of the Phi Kappa Phi honor society, and the Beta Alpha Psi and Beta Gamma Sigma honor fraternities. Judy King Yonce was a resident of Wythe County when she graduated from WCC’s Physical Therapist Assistant program in 1988. She studied at Duke University before completing the pastoral study program at Hiwassee College in 2012. From 1991-94, Yonce was the chair of the Virginia Physical Therapy Association, and she was named the Physical Therapist Assistant of the Year by the Virginia Physical Therapy Association in 1994.Today, she is a licensed Physical Therapist Assistant in Wytheville and the pastor of the Trinity/Mount Olivet Circuit of the United Methodist Church in Pulaski.